Of all the rodents in Wisconsin, one that sticks out, (sorry about the pun), and is the most misunderstood is the lovable porcupine. The common name porcupine means “quilled pig” and its scientific name, “Erethizon dorsatum” means irritable back! Being a slow and lumbering animal while on the ground, predators have no problem running it down. It’s only real protection is its fur which contains stiff guard hairs, soft underbelly fur and up to 30,000 stiff, hollow, barbed quills on its back and tail. This is usually all it needs to make a statement to any carnivore looking for an easy meal! At one time, folks considered them a potential “lifesaver” in the north woods. If a person got lost and was in dire need of sustenance, a porky could easily be dispatched and used as a food source. I personally think I would have to be extremely hungry to actually consider eating one however! Lumbermen and foresters thought of them as competitors as the tree dwelling porcupines at times would girdle valuable timber causing damage and occasionally tree mortality. They have large feet, with rough friction pads that allow good grasp on bark, along with long claws that make them the perfect tree climbing machine! 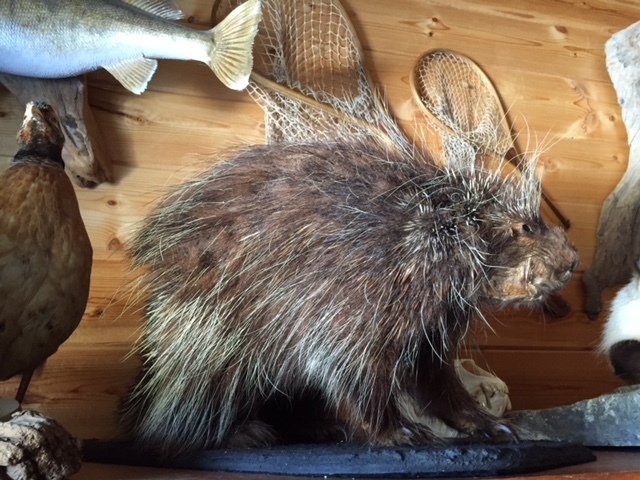 Porcupines also have an affinity for salt and there were reports from early loggers of porkies chewing off the handles of axes left unattended overnight, lusting after the mineral left by sweaty palms. Porcupines are one of our larger rodents, weighing up to 40 pounds. They range up into most of Canada and south into the northern tier of the United States. While they are a forest animal, a population of one porcupine to 25 -50 acres is about average. I’ve have seen them in more heavily forested areas up into Polk County and beyond but have also encountered them in the almost treeless areas of North Dakota. They live in dead, hollow trees, rock shelters and any place they can get out of the weather. Over the years, one has taken up residence below one of our tree stands in Barron County and can be viewed from the stand above as it occupies a cavity below. They are not very good housekeepers as a huge amount of feces is expelled from the den pilling up in an unsightly heap! They are active all year long and will venture out as the temperatures warm but are also very territorial with other porcupines. As mentioned earlier, porkies like to consume the nutrient cambium layer of tree but relish just about any vegetation including corn from farmer’s fields. Like all rodents, they need minerals and will chew up shed antlers and bones from dead animals. They are also good swimmers and have been observed crossing lakes and streams being buoyed up by their hollow quills. One large, fully developed baby is born in May or early June with the quills soft and flexible (thankfully), but will dry and stiffen in a few hours after birth. The average life span of a porky is 7-8 years old. Predators include the fisher, bobcat, coyote, red fox, wolf, bear and horned owl. I have processed fisher skulls that have had several deeply imbedded porcupine quills encapsulated in the flesh of the animals. Predation on a porky must be carefully done or dire consequences can result as infection from the quills or even loss of eye sight can be the outcome. While pheasant hunting, I have had run-ins with porcupines on the ground as my dogs have found them too good to pass up. The porcupines came out on top with my dogs having to experience quill extractions, one at a time, patiently being removed with a pliers. While in my case my dogs were no worse for wear, there have been instances where dogs have had to go to the vet for quill extraction and heavy doses of antibiotics as the quills are really modified hairs with lots of resident bacteria. I find these unique animals fascinating when seen in the wild and while they are not endangered, their numbers are declining in most areas. Seeing one while out and about is truly a remarkable wildlife encounter that everyone should relish!